Discover the pleasure of camping in unique locations in Croatia! Top campsitesYou need to see! Decide to camp in Istria and use the advantages of the green coast, bathed in the Adriatic Sea! 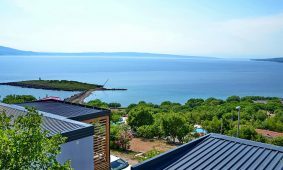 Camp in Kvarner and abandon yourselves to nature – on the coast, on an island or in the greenery of Gorski kotar. Feel the primeval magic of camping and put up a tent on a pitch by the sea! If you favour the comfort of your own home while on holiday at a campsite – mobile homes are perfect for you. Choose the Mediterranean sun and benefits of nature for you and your family. Are you interested in camping and you don’t know which destination is perfect for you in Croatia? Try out the Split region! Find a campsite for yourselves in the southernmost part of Croatia – visit the Dubrovnik region and go on an adventure around the exotic south! Although the majority of campsites are located by the sea, there are also those that enjoy the beauty of the mystical green nature of the continent. Discover the island tradition and abandon yourselves to the magic of nature, untouched by human hand. Experience camping on the islands, surrounded by the sea on all sides! Try a unique camping experience in Croatia – a country of a thousand islands! Use the advantages of the Early Booking offer and benefit from numerous discounts for stays in 2019.! 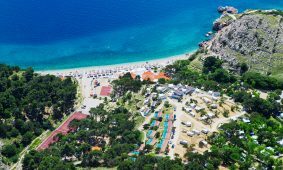 Find a campsite with the “Early Booking” label and get a discount of up to 15% on your next stay in one of the campsites in Croatia! Put the youngsters in touch with nature. Family campsites are made for it – apart from being in the fresh air, surrounded by greenery, family campsites offer a multitude of entertaining activities for the whole family. Because happy children means happy parents. 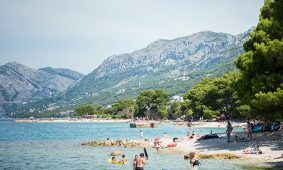 Thanks to their location right on the sea coast, the majority of campsites in Croatia have their own beaches – pebble, sandy, rocky or paved. However, this is not a reason why campsites shouldn’t have swimming pools, too – a place of entertainment and various activities. They say that a dog is a man’s best friend. Wouldn’t you like to spend your holiday with friends? Take your pets camping; these are campsites which will welcome them. Find your own patch of the coast, beaches made of the finest sand, bathed in deep-blue sea, ideal for long barefoot walks. Choose a different visit to a town. Choose a relaxing holiday in nature, but, at the same time, the hustle and bustle of towns and numerous events. 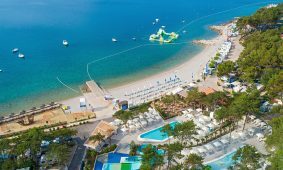 Although the majority of campsites on the Adriatic coast have swimming pools – heated, with attractions and toboggans, water parks – entertaining water worlds for all generations, have become an attraction of late. Have a go at camping in every season of the year – thanks to a mild climate, many campsites in Croatia are open all year round. Camping and active holidays go arm in arm. Regardless of whether you are a recreationalist or a professional sports person, campsites with sports activities are an unmistakeable choice! Add a breath of tenderness to your holiday and enjoy the benefits of wellness during your camping holiday, too. Switch off from the rest of the world and feel an unforgettable wellness experience! Blend in with nature in a relaxing paradise without clothes – naturist campsites give you a magic feeling of intimacy and co-habitation in harmony with nature. Search, compare and choose your mobile home on the Adriatic! Would you like to enjoy all the advantages and the beauty of campsites, but like the comfort and feeling of your own home? 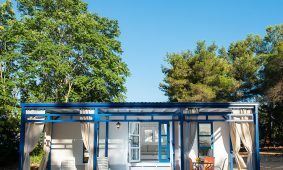 Relax on the terrace of your modern mobile home at one of the numerous campsites of Istria. Feel at home in new age mobile homes – mobile homes in Kvarner are ideal for an intimate stay in nature. 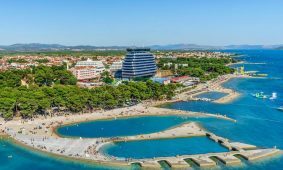 If you are looking for a comfortable holiday in nature by the sea, mobile homes at the campsites in the Zadar region are an ideal choice. Enjoy the freedom of camping – choose a mobile home and experience a new feeling of staying at a campsite. Would you like to spend your summer holidays in a more casual way and experience something different? Opt for the Split region mobile homes, where a campsite becomes a hotel! Looking forward to the sound of the sea, the touch of your bare feet on the grass, but sleeping in a tent is not for you? Choose mobile homes and make what makes you happy come true! You like nature, are looking for ideal and comfortable accommodation, but also near a town? Continental Croatia mobile homes are the best choice. Use the advantages of the Early Booking offer and benefit from numerous discounts for stays in 2019.! In a single place, we bring you a list of all mobile homes with discounts! Are you looking for an ideal mobile home for your holiday and one of the conditions is that it is new? You are in the right place! We bring you a list of brand-new mobile homes in 2018 and 2019! Because the sea is one of the reasons for your holiday – enjoy all its beauty from your mobile home terrace. Breakfast with your loved ones, accompanied by the rustling of the sea or a romantic dinner with a unique sunset – this is what you can experience in a mobile home by the sea. Are you looking for a place where nature and comfort blend, where you will, together with your family, feel at home? Put the youngsters in touch with nature and enjoy all the benefits of family mobile homes, because happy children mean happy parents. 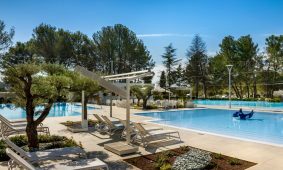 The centre of summer fun, relaxation and socialising – the swimming pool! Although the majority of campsites in Croatia have swimming pools, at some campsites, mobile homes with a private swimming pool, only for the mobile home guests, can be found. Your dog would like us to tell you that there is no need to leave him/her behind if you have chosen a mobile home for your holiday. Take your pets on holiday; these are mobile homes which will welcome them. Although all mobile homes dispose with a kitchen, you sometimes, while on holiday, wish to forget about that everyday chore. If you are looking for a mobile home which also offers a breakfast service, you are in the right place – have a look at all mobile homes with breakfast or half board service. Top-of-the-line equipment, complete comfort, a variety of activities at attractive locations and an unforgettable holiday experience at the highest level await you in mobile homes located in 5-star campsites. Are you looking for a romantic holiday in nature? You are in the right place! Mobile homes for couples are an ideal choice for relaxing weekend escapes, honeymoon or even a longer stay for two. Coexistence in harmony with nature and the feeling of intimacy are guaranteed in naturist mobile homes. Take off the stress and abandon yourselves to a paradise without clothes! Glamping? Imagine a tent, a tree house, a stable or a hut. Now add to it all the comfort that you need during your holiday. Et voilà, you’ve learned what glamping is! Search, compare and choose your apartment on the Adriatic! Camping was never simpler – you don’t need to take any equipment with you! Modern apartments will provide you with a slightly different stay at the campsite. Explore Croatia and familiarise yourself with our tradition, culture and customs! As though made for new experiences and exploring, but also for reiterating and confirming the already known facts – Istria is a unique and distinctive peninsula around which the Adriatic Sea cut deeply into the mainland. 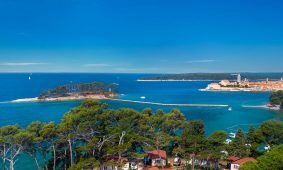 Blending with the indented coast, the sea and Istria create a magic oasis of peace and a place full of tradition, authentic experiences and seductive gastronomy. Kvarner is a destination of holidays, relaxation and entertainment, which joins together the sea, islands and forests. A destination where, in the morning hours, you can sail along island bays and, in the afternoon, hide yourselves from the bustle and relax in the fragrance of a pine tree forest and a coil of clear rivers and streams. You have found a place for your holiday where clear sea gets among pebbles, playing the harmony of peace. You have found a place where history tells the story of people who have been dwelling in this region since ancient times. Central Dalmatia, bathed in a sea blessed with over 300 islands, cliffs and reefs and protected by mountains in the background, is transformed into a treasury of cultural and historical heritage, embedded in the Mediterranean lifestyle. Fields of aromatic herbage, olive oil and green plants, in symbiosis with the white stone which immerses into the clear blue sea. These are the descriptions of this exceptional area, to whose exclusiveness, apart from its natural beauty, also contribute numerous historical tales and cultural heritage, tradition and customs. Their blend makes this region a realm in which diversities harmoniously meet. Head for adventure across the exotic south, absorb the smells of citrus fruit and vistas of towns of irresistible charm. This is a region where stone, as the main ruler of its streets, has for centuries been proudly engraving its stamps in the frontages of palaces, villas and churches. The green, serene and almost mystical primeval nature of Lika has created a space of eternal attractiveness, while in Senj it created a thousands of year’s old whistle of the bora wind. For reasons unknown to men, nature forebode that, in Karlovac, four rivers meet, blending into a beauty of unpredictability and strength. Do you strive towards idyllic green surroundings; are you an admirer of a quiet and pleasant continental environment, which leads to romantic castles, medieval manor houses and country mansions? Would you like to experience the tradition and the customs of the continent? Head for the north-east of Croatia and enjoy Continental Croatia! Learn the Croatian fairy tale of 1.244 islands, islets, cliffs and rocks, which is told along the whole of the Adriatic Sea. Each of them tells its own historical story, interwoven by customs, landmarks and natural beauty. The romantic atmosphere of secluded bays delights yachtsmen and introduces them to a relaxed way of living on the islands. You would like to visit some of the most beautiful towns of Croatia? Look for a relaxing holiday in nature, but in the vicinity of town events, landmarks and festivals. Choose the campsites located close to towns and enjoy all the advantages of towns. Visit all the landmarks, join events and listen to the footsteps of their citizens. From some campsites, a leisurely walk will take you to old town centres, where you will be able to acquaint yourselves with the town’s historical heritage. The campsites near towns are an ideal blend of towns’ everyday busy life and the vicinity of the sea. We bring you a list of campsites in the vicinity of towns – choose your campsite and acquaint yourselves with the desired destination. Looking for the best offer? Your request has been successfully received! We will make sure that someone from our team takes over and responds to your request as quickly as possible (in the following 24 hours during the workdays). If you do not receive our answer within 24 hours, please check your Spam folder just in case the email got delivered there instead of your inbox. Book now - pay at the campsite!